Were 18 foot long thresher sharks responsible for closing a New York beach? Earlier this week, several New York state beaches were closed due to shark sightings. Fox News’ Rick Leventhal, speaking as part of Bill Hemmer’s “America’s Newsroom” show, reported on this story, claiming that “some onlookers ID’ed them as thresher sharks, they’re estimated to be about 18 feet long”. A half-eaten seal also washed up on shore nearby. To his credit, Mr. Leventhal attempted to play down fears about these animals, saying that “Let’s not forget that sharks live in the ocean…as long as there’s food, they’re likely to keep hanging around”. However, I was immediately skeptical of the claim that a group of 18 foot long thresher sharks were swimming slowly just a few yards offshore. 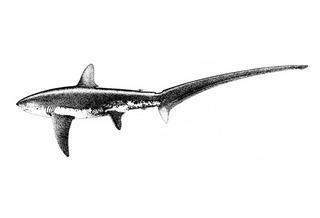 A cursory review of the known biology and ecology of thresher sharks will explain my skepticism. First of all, there isn’t one animal called a “thresher shark”. There are three species of thresher shark , family Alopidae, currently recognized by scientists (though this may increase to four based on a 1995 genetic study) . These are the Bigeye Thresher (Alopias supercillosus), the Pelagic Thresher (Alopias pelagicus), and the Common Thresher (Alopias vulpinus). The Pelagic Thresher’s range does not include the Atlantic Ocean, so we can safely rule them out as the culprit. The maximum recorded size of the Bigeye Thresher is 461 cm, a little over 15 feet. If we accept that the sharks in question were actually 18 feet in length, then either several of the largest Bigeye Thresher sharks ever seen just visited the Hamptons, or we’re dealing with another species here. Scientists occasionally find specimens that are larger or older than what we previously believed possible- just this month I was present as a bonnethead shark that was several years older than the theoretical maximum age was captured- but this is rare. The maximum recorded size of Common Threshers anywhere in the world is 573 cm , which is a little over the 18 feet reported in this case. However, that maximum size was reported more than 20 years ago, and it is extremely rare to find animals that size anymore. It’s possible that 18 foot Common Threshers are still around, but it’s extremely unlikely. Threshers just a few yards offshore? Both the Common Thresher and Bigeye Thresher are most common offshore over the continental shelf, but both have been described coming inshore in shallow water. This behavior is rare, but it happens. Thresher sharks swimming together in a pack? There is little documentation concerning the cooperative feeding behavior of thresher sharks, though the Encyclopedia of Life notes that “sometimes two threshers may cooperate in their attack, swimming round the school of fish in ever decreasing circles”. Thresher sharks do not eat seals. The diet of both the Bigeye Thresher and the Common Thresher consist mostly of small to medium sized fast-swimming pelagic teleost fishes and squids. In the video, you can clearly see that the animals are swimming very slowly along the shoreline. This is inconsistent with typical thresher shark behavior. Both species have a relatively high cruising speed, which is necessary to catch their fast-swimming fish and squid prey. A review of the biology and ecology of these animals makes it seem unlikely that the sharks in question are actually thresher sharks. The size and observed swimming speed would be extremely rare for either species of thresher shark found in the Atlantic. It’s also atypical for these animals to come so close to shore. From this information alone we can conclude that the sharks were probably not thresher sharks. Alternatively, we could just look at the sharks in question, thanks to the relatively high-quality video that was taken. In particular, note that the caudal fin (tail) is extremely long. In some cases, the top lobe of the caudal fin can be almost as long as the rest of the shark. Also, the dorsal fin is different. That is obviously not what the shark in the video above is. What could it be? Note in particular the dorsal fin. As it turns out, several basking shark experts I know have independently identified the animal as a basking shark from the video and photo shown above. Case closed. Vote for us in the 3QuarksDaily science writing contest! Everybody can get back in the water. If be interested to hear more about the bonnet and what led you to believe and what methods you used to confirm its exceptional age. To bad they closed the beach cause that was time to grab the snorkel gear and get in! All they did was add to the fear of sharks. I agree that the video clearly shows basking sharks, but a basking shark did not eat half a seal. Could one say that Fox News has an Alopidae bias, now, too? Nice post David. Its funny, I live on Long Island, in the hamptons, and I hadn’t even heard of these sharks. My mother called me because my grandma saw it on the news sharks on long island and was worried, and that’s how I found out. That being said, we frequently see basking sharks out here, big ones, and I think you’re likely conclusion is the correct one. You can see threshers, but you have to go much farther out, as far as I know, to do so. 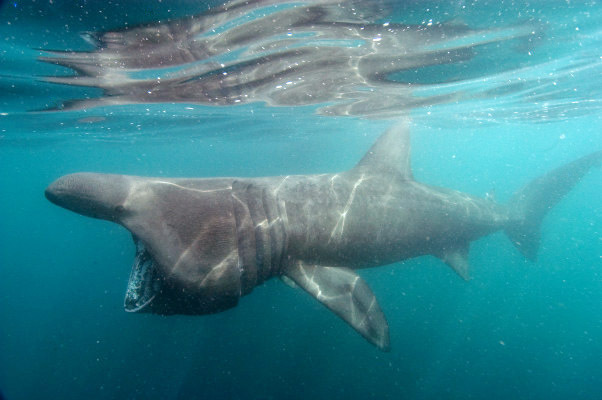 ..As someone who has researched this species for many years and seen hundreds if not thousands of them I can say with certainty – these pictures are of basking sharks. Interestingly using satellite tags we have tracked some individuals from the British Isles across the Atlantic and this may be contributing to a recovery of basking shark numbers along the Atlantic coast of North America. They are certainly animals to run into the sea for, not out of the sea for fear of!! I am not sure how these were identified as threshers as neither their morphology nor behavior are thresher-like. 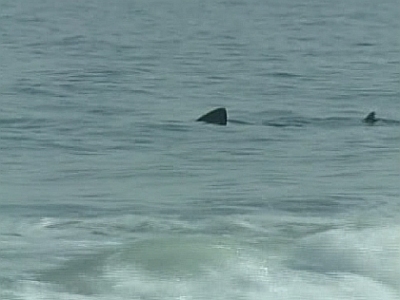 Plus, based on the dorsal fins and the heads, which are visible in part of the video, theses are clearly basking sharks. I do have two comments on the blog. First, Alopias vulpinus are often referred to as “Common Threshers”, but just calling them “threshers” is actually more appropriate. Second, though not much is known about thresher behavior and cooperative feeding is not well documented, threshers are known to aggregate in the Eastern Pacific, which is part of what makes them so vulnerable to certain fisheries. In the recent days a good number of Thresher sharks from 200-500lbs have been caught 1/2 mile to a mile off the beaches of Western Long Island.